Mantell (Feb. 3, 1790 – Nov. 10, 1852), a physician of Lewes in Sussex in southern England, had for years been collecting fossils in the sandstone of Tilgate forest, and he had discovered bones belonging to three extinct species: a giant crocodile, a plesiosaur, and Buckland's Megalosaurus. But in 1822 he found several teeth that "possessed characters so remarkable" that they had to have come from a fourth and distinct species of Saurian. After consulting numerous experts, Mantell finally recognized that the teeth bore an uncanny resemblance to the teeth of the living iguana, except that they were twenty times larger. In this paper, the second published description of a dinosaur, he concluded that he had found the teeth of a giant lizard, which he named Iguanodon, or "Iguana-tooth." Mantell illustrated his announcement with a single lithographed plate. 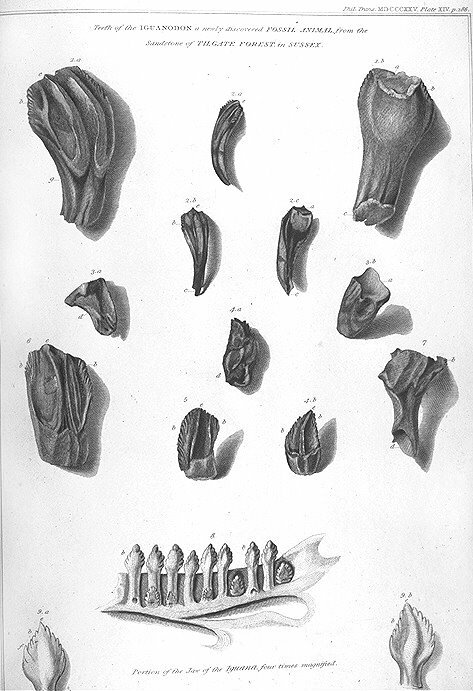 Mantell included at the bottom of the plate a drawing of a recent iguana jaw, which is shown four times natural size, and for further comparison, he added views of the inner and outer surface of a single iguana tooth, "greatly magnified." The traditional story that Mantell's wife found the first teeth in 1822, while the doctor was visiting a patient, appears, alas, to be unfounded. Info and plate from HERE.